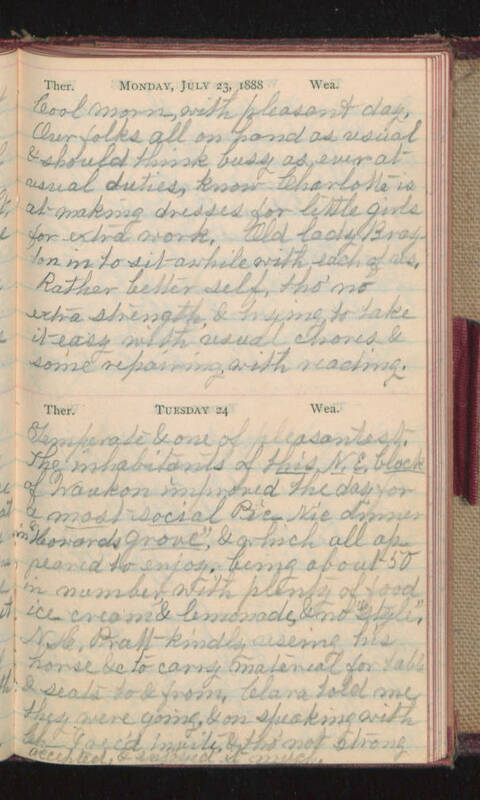 Monday, July 23, 1888 Cool morn, with pleasant day. Our folks all on hand as usual & should think busy as ever at usual duties, know Charlotte is at making dresses for little girls for extra work. Old lady Brayton in to sit awhile with each of us. Rather better self, tho' no extra strength, & trying to take it easy with usual chores & some repairing with reading. Tuesday 24 Temperate & one of pleasantest. The inhabitants of this N.E. block of Waukon improved the day for a most social Pic-Nic dinner in "Howards Grove", & which all appeared to enjoy, being about 50 in number with plenty of food, ice cream & lemonade, & no "style", N. H. Pratt kindly using his horse &c to carry material for table & seats to & from, Clara told me they were going, & on speaking with Ch- I rec'd invite, & tho' not strong accepted, & enjoyed it much.